Journal of Nanjing Agricultural University, 2019, 42(2): 308-315. 程德义, 邵爱云, 杜超, 等. 巯基改性稻壳炭吸附Zn(Ⅱ)的性能[J]. 南京农业大学学报, 2019, 42(2): 308-315. Abstract: [Objectives] A new adsorbent(RD550) was prepared by esterification of -OH on rice husk carbon and -COOH on thioglycolic acid to remove zinc from wastewater. 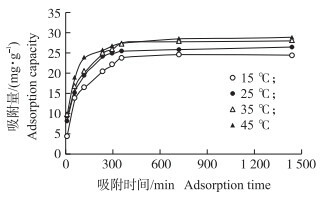 [Methods] The effects of pH value, dosage, reaction time, reaction temperature and desorption on the adsorption were studied by using the adsorbent materials before and after modification. The morphology and functional groups of the modified rice husk carbon were characterized by scanning electron microscopy(SEM), fourier transform infrared spectroscopy(FTIR) and X-ray photoelectron spectroscopy(XPS). [Results] The results of SEM, XPS and FTIR showed that the sulfhydryl group had been grafted onto rice husk carbon successfully. The porosity of rice husk charcoal increased, and the content of S also increased, which was beneficial to the adsorption of zinc. 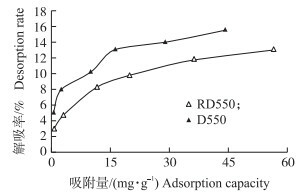 The suitable pH for the adsorption of Zn(Ⅱ) by thioglycolated rice husk carbon was 6.50, and the adsorption equilibrium reached within 360 min, which accorded with the pseudo-second-order kinetic equation. From the perspective of adsorption efficiency and cost saving, when the amount of adsorption material was 0.10 g, the adsorption effect was the best. The adsorption process accorded with Langmuir adsorption model. 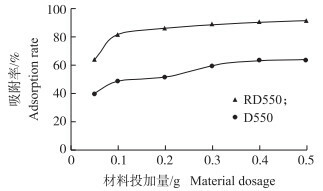 The maximum adsorption capacity of Zn(Ⅱ) on sulfhydryl rice husk carbon was 68.03 mg·g-1. Combined with desorption experiment, the adsorption of Zn(Ⅱ) on sulfhydryl rice husk charcoal was stronger than that on unmodified rice husk carbon, and the desorption rate was 2.91%-13.12%. [Conclusions] By chemical modification, the functional group -SH can be bonded to rice husk carbon, and the affinity of S to heavy metals can be used to improve the adsorption performance of the adsorbent, which is of great significance for the removal of Zn(Ⅱ) from wastewater. 图 1 改性稻壳炭前(a)、后(b)的扫描电镜图和X-射线光电子能谱图(c) Fig. 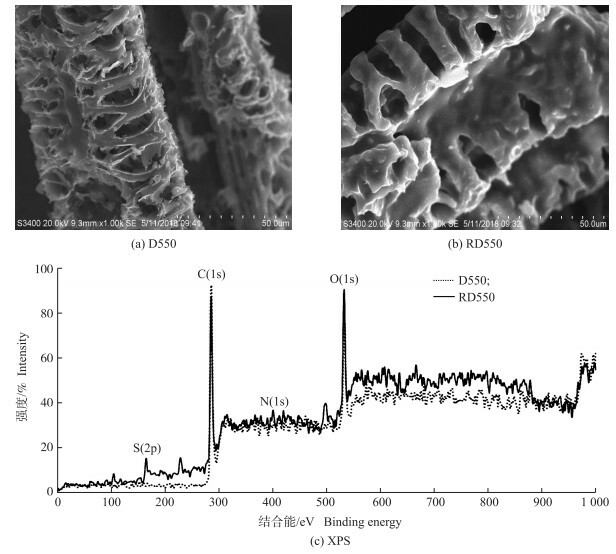 1 Scanning electron microscope(SEM) before(a)and after(b)modified rice husk carbon and X-ray photoelectron spectroscopy(XPS)(c) D550:未改性的稻壳炭Unmodified rice husk carbon; RD550:巯基改性后稻壳炭Sulfydryl modified rice husk carbon. 李爽, 杜翔宇, 张继国, 等. 巯基改性壳聚糖薄膜的制备[J]. 广东化工, 2017, 44(12): 17-31. 李青竹, 覃文庆, 柴立元, 等. 巯基化改性麦糟对Zn(Ⅱ)的吸附特性[J]. 中国有色金属学报, 2014, 24(4): 1076-1083. Li Q Z, Qin W Q, Chai L Y, et al. Adsorption characteristics of Zn(Ⅱ)on thiol-functionalized spent grain[J]. The Chinese Journal of Nonferrous Metals, 2014, 24(4): 1076-1083 (in Chinese with English abstract). Qin Y C, Guan X H, Yin R, et al. Preliminary research on Cd2+ removal from wastewater by Sphaerotilus natans[J]. 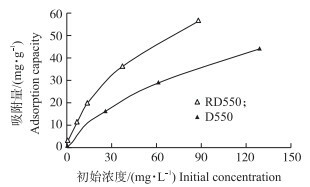 Chemical Research in Chinese Universities, 2005, 21(6): 654-657. 谢婧如, 陈本寿, 张进忠, 等. 巯基改性海泡石吸附水中的Hg(Ⅱ)[J]. 环境科学, 2016, 37(6): 2188-2194. Xie J R, Chen B S, Zhang J Z, et al. Adsorption of Hg(Ⅱ)in water by sulfydryl-modified sepiolite[J]. Chinese Journal of Environmental Science, 2016, 37(6): 2188-2194 (in Chinese with English abstract). 刘延志, 田胜艳, 商平, 等. 蒙脱石吸附Cr3+、Cd2+、Cu2+、Pb2+、Zn2+的研究:pH值和有机酸的影响[J]. 生态环境, 2005, 14(3): 353-356. 王静, 陈光辉, 陈建, 等. 巯基改性活性炭对水溶液中汞的吸附性能研究[J]. 环境工程学报, 2009, 3(2): 220-222. Wang J, Chen G H, Chen J, et al. Investigation on aqueous Hg(Ⅱ)adsorption properties by thiol-modified activated carbon[J]. Chinese Journal of Environmental Engineering, 2009, 3(2): 220-222 (in Chinese with English abstract). 李媛媛, 董泳秀, 刘文华, 等. 巯基化膨润土对As3+的吸附解吸性能研究[J]. 环境保护科学, 2015, 41(1): 104-108. 吕娟, 王明峰, 蒋恩臣, 等. 不同热解温度下稻壳炭的理化特性分析[J]. 可再生能源, 2017, 35(10): 1488-1453. Lü J, Wang M F, Jiang E C, et al. Physicochemical characteristics of rice husk carbon at different pyrolysis temperatures[J]. Renewable Energy, 2017, 35(10): 1488-1453 (in Chinese with English abstract). 许继星, 黄维秋, 王翊红, 等. 稻壳基脱硅活性炭的制备及其对油气吸附性能研究[J]. 化工新型材料, 2017, 45(9): 212-214, 217. Xu J X, Huang W Q, Wang Y H, et al. Preparation of activated carbon from the desilication residue of rice husk and adsorption of oil vapor[J]. New Chemical Materials, 2017, 45(9): 212-214, 217 (in Chinese with English abstract). 唐伟, 郭悦, 吴景贵, 等. 老化的生物质炭性质变化及对菲吸持的影响[J]. 环境科学, 2014, 35(7): 2604-2611. Tang W, Guo Y, Wu J G, et al. Structural changes of aged biochar and the influence on phenanthrene adsorption[J]. Chinese Journal of Environmental Science, 2014, 35(7): 2604-2611 (in Chinese with English abstract). 陈云嫩, 吴叶, 刘海兵, 等. 巯基/羧基改性麦糟吸附水中三价砷的研究[J]. 有色金属工程, 2017, 7(4): 96-101. 邓华, 严发, 陆志诚, 等. 巯基改性木薯秸秆对Cd(Ⅱ)吸附性能的研究[J]. 水处理技术, 2018, 44(6): 57-61. Deng H, Yan F, Lu Z C, et al. Study on the adsorption of Cd(Ⅱ)by sulfydryl modified cassava straw[J]. Technology of Water Treatment, 2018, 44(6): 57-61 (in Chinese with English abstract). 王英惠, 杨旻, 胡林潮, 等. 不同温度制备的生物质炭对土壤有机碳矿化及腐殖质组成的影响[J]. 农业环境科学学报, 2013, 32(8): 1585-1591. Wang Y H, Yang M, Hu L C, et al. Effects of biochar amendments synthesized at varying temperatures on soil organic carbon mineralization and humus composition[J]. Journal of Agro-Environment Science, 2013, 32(8): 1585-1591 (in Chinese with English abstract). Arslanoglu H, Altundogan H S, Tumen F. Heavy metals binding properties of esterified lemon[J]. Journal of Hazardous Materials, 2009, 164(2/3): 1406-1413. Qin Q D. Study on selective adsorption of pollutants in water by functionalized mesoporous material MCM-41[D]. Harbin: Harbin University of Technology, 2009(in Chinese with English abstract). 李珊珊, 冯燕, 段莲, 等. 改性玉米秸秆对重金属吸附性能研究[J]. 黑龙江畜牧兽医, 2017(7): 150-153. Li S S, Feng Y, Duan L, et al. Adsorption of heavy metals by modified corn straw[J]. Heilongjiang Animal Science and Veterinary Medicine, 2017(7): 150-153 (in Chinese with English abstract).